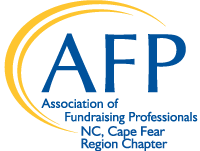 AFP Cape Fear Chapter is the your local peer to peer resource to share fundraising knowledge to increase your professional development. You can become more involved, build your experience, and network with fellow fundraisers through volunteering the AFP Cape Fear Chapter. Work on the NPD Committee to organize the annual fundraiser which recognizes excellence in the area of giving. You can be a big part of this by helping with the nominating process, planning, and publicity in order to make this event a success. If you are interested in learning about the event and would like to help with this community awards program, please contact Lauren. Work with our Program Chair, Beth Gaglione to develop an monthly speaker and topics for our programs. Connect with community leaders to fill each monthly meeting with quality speakers. If you are interested in helping with programs or would like to be a speaker, please contact Beth. Work with communications chair, Laurie Taylor on communications using Icontact on upcoming programs and other events, and help help bring a new chapter website online; and keep up to date with job postings and upcoming programs and events. If you are interested in helping with communications to your peers please contact Laurie.